You only get one opportunity to make a good first impression. That’s why AJG’s initial sales conversation presentation is vital to taking each opportunity to the next stage in the sales process. It needed to be impressive, relevant & compelling. AJG is one of the world’s largest insurance brokerage and risk management companies, which employs more than 21,500 people worldwide in more than 150 countries. The brief was simple, to help the Account Executives and Business Development team convert more initial prospect meetings into a second meeting with a specific deliverable. Create an impressive visual presentation that reflects the capability and scale of a multi-billion dollar organisation, with local presence and knowledge. 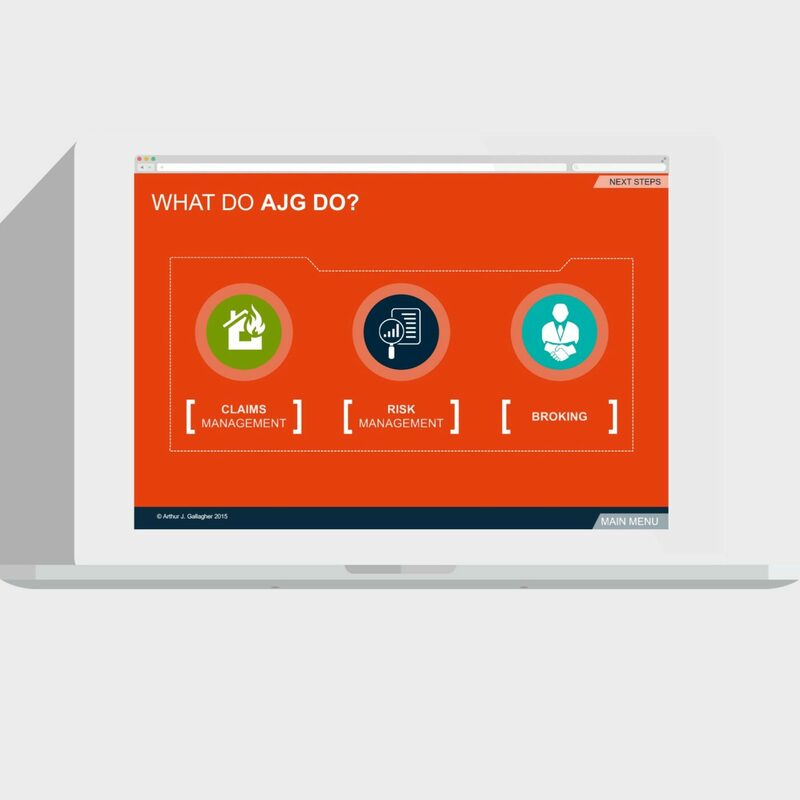 Using engaging visuals embedded into an interactive sales tool, deliver compelling messages to AJG prospects that will educate them as to why they need to 'do something different'. Teach colleagues to deliver relevant, compelling and concise messages which will result in a second meeting. This will allow AJG to demonstrate how they can add significant value based on additional information they will obtain between the first and second meeting. Before we even contemplated working on the presentation, we first ran a sales messaging workshop with the relevant stakeholders to challenge, define and articulate the AJG Retail ‘Value Proposition’. Once agreed, we crafted a visually engaging presentation (PowerPoint but not as you know it!) which helped the team to not only communicate the proposition, but to also probe and identify how the AJG proposition will be relevant as part of the ‘pre-sales’ activity. Finally, we hosted a two-day training programme to not only teach the team how to deliver the presentation effectively, but to also help them understand the science behind effective interactive sales presentations and why traditional presentation don’t work. Think selling in 2016 not the 1990’s! The overall engagement and deliverables were superb and unlike anything I have experienced before. It helped my team to understand why traditional presentations don't work and how to use our new sales presentation to engage the audience and deliver relevant content. The sales messaging, slide production and coaching have resulted in a significant improvement in the ‘first to second’ meeting conversion rates. This was the primary objective of the engagement, which was to deliver a compelling proposition in ‘meeting one’ which would gain the approval of the prospective buyers to provide additional information and secure ‘meeting two’, where we could present our initial findings and recommendations.